Every now and then I look on Ravelry to see who knitted one of my patterns and I am so happy whenever a knitter completes a project. It makes me so happy that a knitter all the way in Spain was able to purchase my poppy flower pattern and give it her own touch by creating such a precious piece. So very well done, Rosalia, I thoroughly enjoy your work! Rosalia is known as Rosalias on Ravelry and also has a blog called El mon de Rosalia. I think it is pretty neat how we overcome distances through the web and that we are able to inspire each other and enjoy each other's work online. It is for this very reason I make patterns and put them out there: to inspire other knitters and to be inspired by knitters. This way, we keep our creative juices flowing and we keep our sparkle for inspiration and creativity alive. 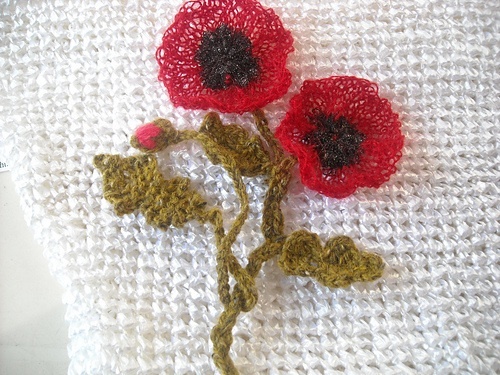 Thank you, Rosalia, and all other knitters out there who have knitted one of my patterns! Submitted by Nancy Ricci on Tue, 06/29/2010 - 04:26. Hi you two, yes she did a great job! Submitted by Anonymous on Sun, 06/27/2010 - 16:24. Submitted by Anonymous on Sun, 06/27/2010 - 14:10.